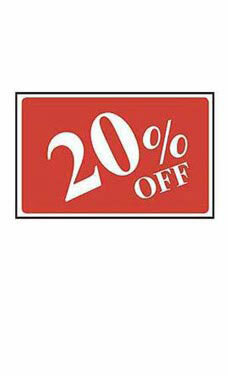 The 20% Off Sign is great for promoting your sale merchandise throughout your store. The signs can be mounted on wall surfaces or on top of clothing racks and displayers. The sign is 7"H x 11"W with durable scratch-resistant, heavy-duty plastic. The sign features white print on a bold red background.